The Hamptons. Eze. Killiney. All beaches that Bono and The Edge have strummed a guitar and sung on over the years. Thanks to Boston radio station WWBX, Mix 104.1, and its parent company, Entercom Communications, we can add Cape Cod to that list. (Well, Bourne to be exact). The radio station's annual Mix 104.1 Beach House events have seen performers like Train, Chris Martin, Ed Sheeran, John Mayer, Kelly Clarkson, Shawn Mendes and Meghan Trainor visit lucky listeners who win a week's stay at a million-dollar beach house on Cape Cod and an exclusive performance by the artist. This year, to the surprise of everyone at the station and sponsor Cumberland Farms, Bono and The Edge decided to join in the fun. 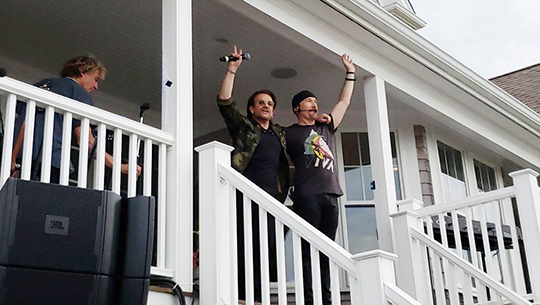 WWBX's Music Director Mike Mullaney told @U2 on Saturday that U2's been on the station's wish list for the Mix Beach House since the contest began in 2016, but he never figured an artist with U2's stature would do this type of an event. He said it was a privilege to have the band partner with the station in this way, and he was thrilled that the band chose to perform "Summer of Love" for the first time in public at the Mix Beach House. Bono said during the performance on the back porch, "It's a very nice feeling to be doing this kind of stuff. When you get big and fancy and all those Grammys, people forget that it's you people who have actually given us this life; and it's people playing our songs on the radio that mean that we still feel relevant." The approximate 200 attendees on the beach house's lawn were a combination of radio contest winners from across the country, radio station personalities and executives, station advertisers and their guests. Neighbors from surrounding homes lined the road leading up to the Mix Beach House, and about 100 or so boaters and kayakers positioned themselves on the Cape Cod Canal waters close to the house. Beachgoers across the canal could also listen in as the sound system was quite clear. Mix 104.1 grand prize contest winner, Leann O'Meara, her husband Jim and 20 of their close friends and family (pictured below) were the guests of honor at the event. She said choosing who to invite was a bit like planning a wedding. O'Meara wanted to make sure all of her guests shared an appreciation for the band's music and message. She had guests fly in from Florida and South Carolina, drive from Pennsylvania, Connecticut and all across Massachusetts for this once-in-a-lifetime experience. O'Meara told us before heading over to the event that all she wanted to do was shake Bono's hand and say thank you for all the band means to her and her family. By the end of the event, she got much more than that: There was a pre-show meeting where she and her husband got to do all those things and have Bono talk with her son. Topping off the day, as Bono was leaving, she was able to get an autograph and a kiss on the cheek. (Jim was not at all upset with Bono kissing his wife). Leann said at the end of the performance, "It was incredible. I was crying. It's overwhelming." The couple called this event a "full-circle moment" as they met almost 30 years ago, sharing a love for U2's music from the beginning of their relationship. Leann met most of Jim's family at a U2 concert for the first time, and since then they've been to several U2 shows when the band's in the New England area. Her favorite albums are The Joshua Tree and All That You Can't Leave Behind. This isn't the only U2 experience for the O'Mearas. As part of the grand prize, they will be flying over to Dublin to catch the band in November. Leann said her daughter had to miss out on the Mix Beach House event as she's on a missions trip, but she will be able to join the family for the Dublin trip. She said that die-hard fans really do win these types of contests, and she still can't believe that she was chosen as the grand prize winner. Michael Dufault, Leann's brother-in-law, was one of her guests for the event. He said that U2's music has been the soundtrack to every major milestone in his life. His first show was March 13, 1992 in Worcester, MA, and he's tried not to miss a tour since. He is grateful for the role the band's had in shaping who he is, and feels U2's universality is what transcends them beyond just a rock band. "It's not a concert, it's an event," he said. After the Mix Beach House performance he said, "I'm in tears. It was unbelievable. I can't put it into words yet. It was special." Other Entercom stations also took part in allowing contest winners to attend. Hartford, CT's 96.5 WTIC allowed a winner and 10 guests to attend the event. Stations in Houston, San Francisco and Kansas City also sent a winner and a guest to the event. 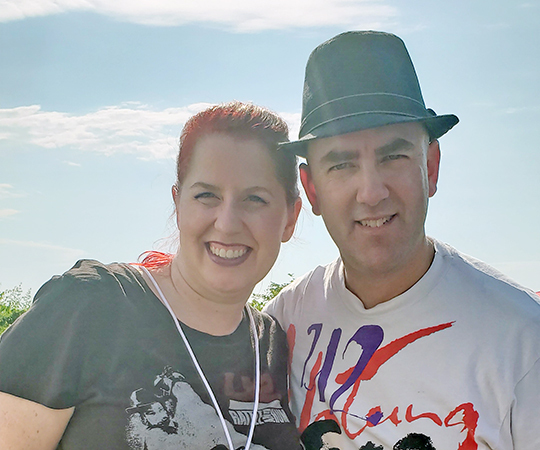 Wendy Yancey and John Lee (pictured below) were the lucky ones who won their way to the Mix Beach House after getting through on the Sarah and Vinnie morning show on San Francisco's Radio Alice 97.3. Yancey made sure to bring Pink Adam with her for the occasion. They both felt they were "living the dream" being able to see Bono and Edge perform in such an intimate setting. As for the performance, the relaxed setting brought different banter between Bono and Edge. Bono spoke of Abu Ward, the gardener of Aleppo, encouraging people to get to know his story. He introduced "Love Is Bigger Than Anything In Its Way" as a tribute to Ward and his son, saying "how indomitable the human spirit is." During "One," Bono referenced the Families Belong Together march happening across the country. "All the people on the march in D.C., we can feel you. We can hear you," he said. He also spoke about how he spent only two weeks in college before joining the circus known as U2. Edge admitted he spent eight weeks in college himself. The interplay between the two was not anything many had heard in their promotional or concert appearances of late. It would be cliché to say that overall it was a "Beautiful Day," but that's exactly what it was. You couldn't have asked for a nicer summer day on Cape Cod, and no one could have dreamed that Bono and Edge would provide the tunes to accompany a day like this. That dream became reality for all who were lucky to be there.